Today I'm launching 40 sites in Australia. Are you an Australian local? Perhaps you are looking for the best indian restaurants in Melbourne? Jewellery shops in Sydney? The most popular antique stores in Brisbane? Or maybe, like me, you are just feeling touristy want to dream away to the Great Barrier Reef or exotic beaches? You can do that too. I am sure you'll be able to find some kangaroos! 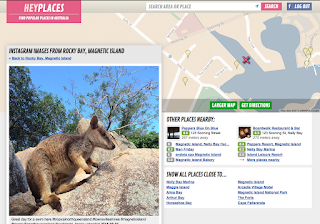 Heyplaces.com.au guides you to more than 800.000 places in Australia, with more than 1.5 million images (and growing every day) so there is A LOT to discover. Dig in and start exploring the best cafés, bars, hotels, motels, restaurants, sushi, pizza, vego, hostels, bed and breakfast, camping, beaches, shops, vintage, companies, golfing, bowling, yoga, bakeries, tattoo, gyms, hairdressers, spa, beauty, nail salons, dentist, health clinics , chiropractors, massage, sports, schools, pharmacy, auto shops, car wash, car rental, libraries, theaters, museum and galleries in Australia.